All was not lost however. On Day 2 of our week long stay in Hobart we visited the local Visitor Information Centre and kitted ourselves out with a Hobart Bike Map for $8.00. The map lists 9 family rides on multi-user paths and 20 regional rides (which are almost exclusively on road) as well as BMX tracks, skate parks, dirt jumps and bike shops. 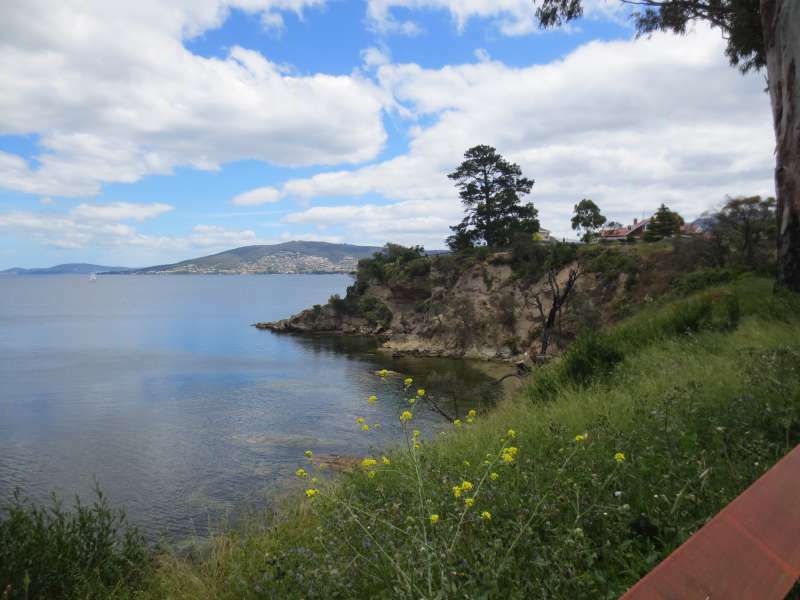 Many of the road rides looked pretty good, such as the 36km loop from Richmond, an historic town north-east of Hobart. This is me standing in front of Richmond Bridge. 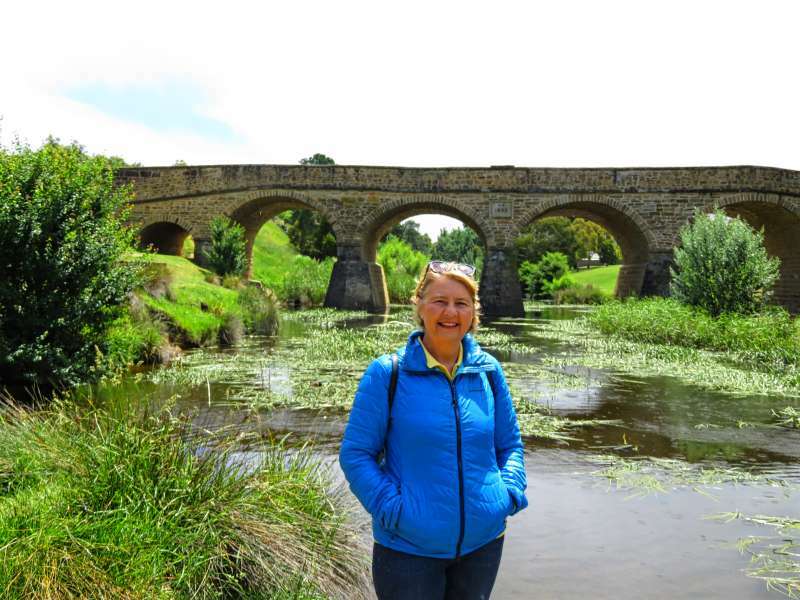 It was built by convicts in the 1820s and is the oldest bridge in Australia. It was the rides on multi-user paths we were interested in. Most are less than 10 kilometres - hardly worth the effort. One or two such as the 12km Pipeline Track looked interesting but we couldn't fine anywhere nearby to hire bikes. In the end it came down to two rides. Option 1. 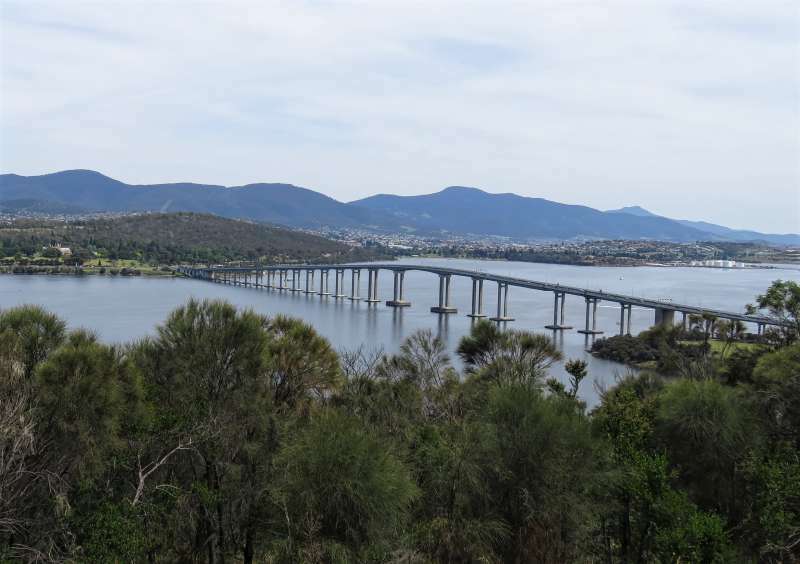 - Hobart to Claremont along the Intercity Cycleway. The Intercity Cycleway is 31 kms return, using an off-road, shared path the whole way. It finishes at the Cadbury Chocolate Visitor Centre. This would have been a great bonus but for two things. I don't eat chocolate (well - very rarely) and the Visitor Centre closed to the public in 2015. Despite the scary looking contour map on the Greater Hobart Trails website, the path is almost flat. The highest point of the trail is only 30 meters above the lowest. A few kilometres before it ends the trail goes past MONA - a Museum of Old and New Art. Combining a nice cycle along the western shore of the Derwent River with a visit to a museum described by its owner as a 'subversive adult Disneyland' was superficially attractive until we found out the admission price; $28.00 each - ouch! All we wanted was a quick look around. We would have cycled 15kms to get there and have another 15 km to get back before the 5 p.m return time on our hire bikes. Maybe museums, art galleries and other attractions could consider a special cyclists' concession price, available only to those on two wheels who walk in looking exhausted. 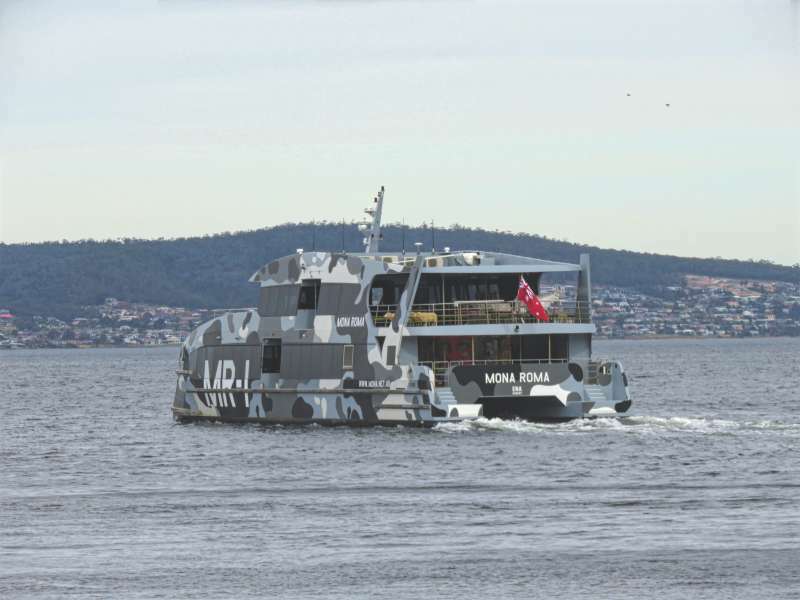 You can also get to the MONA from central Hobart on one of their futuristic/militaristic looking ferries. 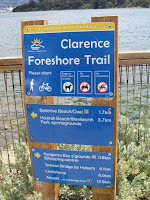 The Clarence Foreshore Trail runs along the east bank of the Derwent River for 15 kms. You can add an extra few kilometres at the southern end by cycling along Howrah Road to join up with another short section of track at Tranmere. The path looked deceptively flat on our map. To be fair most of it is flat but there are a couple of steep sections which tested our mettle - particularly mine which for some reason wasn't up to its normal strength that day. The detour around the sewerage works at Rosny Hill is particularly challenging - I walked that bit! 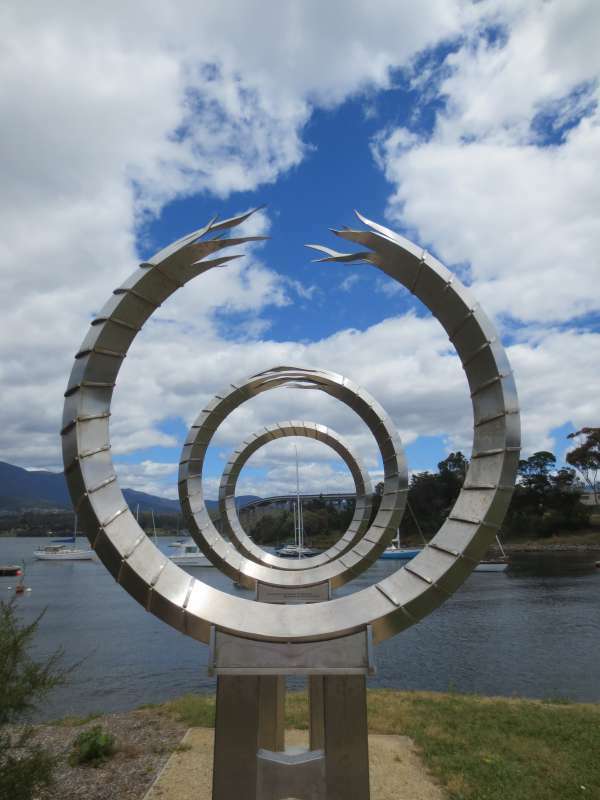 I thought this sculpture, just the other side of the Tasman Bridge was worthy of Sculpture by the Sea. Almost the entire path is right next to the river making it a great scenic leisure ride. 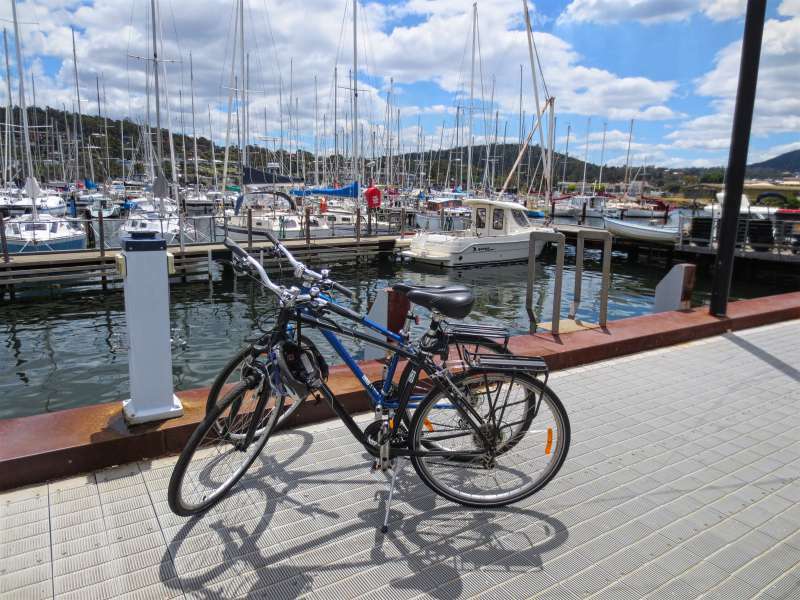 There is a waterfront pub and cafes at Bellerive, about half way between Geilston Bay and Howrah, and loads of lovely spots to stop and share a picnic. Most of the path is sealed but there are a few short sections which were unsealed. Our hire bikes on the Clarence Foreshore Trail. The only seriously challenging part of the ride was crossing the Tasman Bridge. If you can possibly avoid this - do it. 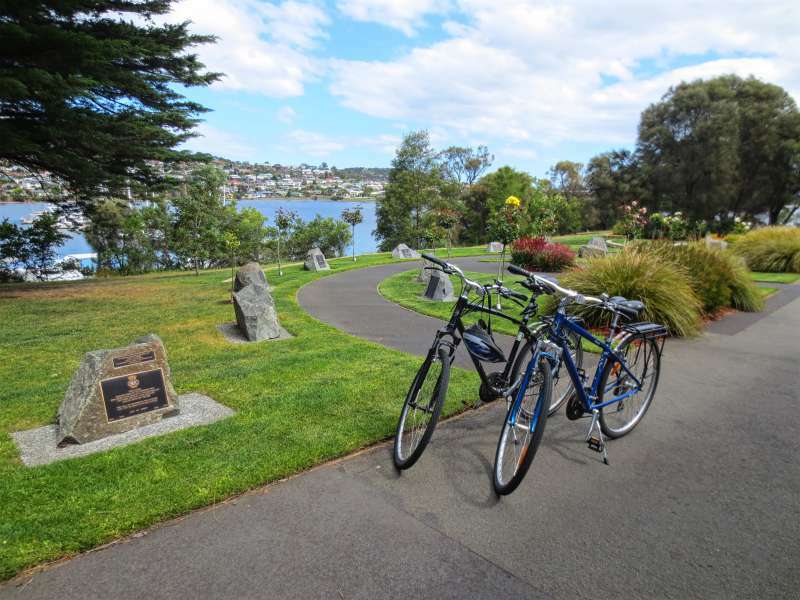 We hired our bikes at Hobart Bike Hire which is on the western side of the Derwent. The shop owner warned us that the cycling/walking path on the Tasman Bridge was narrow and treacherous. There was no avoiding it though and since the bridge is more than a kilometre long, dismounting and walking across wasn't really an option. 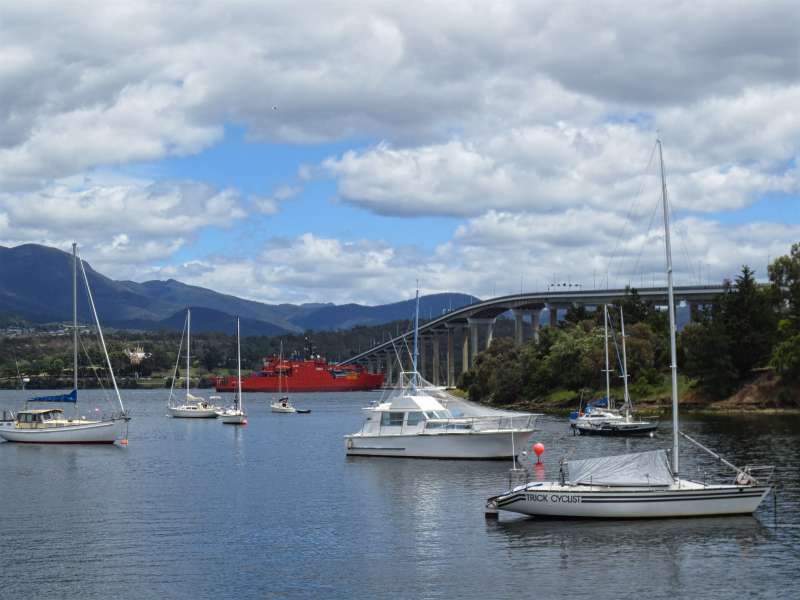 This is the same Tasman Bridge which 42 years ago was cut in half by a bulk ore carrier killing 12 people and leaving several cars balanced precariously on the edge of the missing roadway - click here for a photo. You can see what a precision manoevre it is to sail a large ship under the bridge. The bike shop owner wasn't wrong about it being tricky to cycle across the bridge. David later described it to him as 'challenging'. The traffic seemed only centimetres from us and each passing truck presented the terrifying threat that a wing mirror or other protruding object would sweep us off our bikes and onto the roadway. Each gust of wind brought with it a similar fear. Add to that the fact that every few hundred metres the path was partly blocked at about the level of our heads with bits of machinery, (electrical boxes or switches or something), and my personal safety radar was screaming with tension. On the couple of occasions where we had to pass cyclists coming toward us, we had not only to dismount (fair enough) but flatten ourselves against the guardrail in order to have room to let them by. I can honestly say I don't think I have ever been so glad to finish a stretch of cycle path. Next time I think I'll walk the kilometre, especially if there is any wind. Although crossing the Tasman Bridge by bicycle was a challenge it was worth it for the lovely scenery along the Clarence Foreshore Trail. Port Arthur - A World Heritage Convict Site. I publish a new post each week - last week life got in the way. If you would like to follow our travels, check back each week or enter your email address in the 'Never miss a post: Follow by email' box in the right hand sidebar just below my profile picture. Getting across that bridge would probably have stopped me. You two are always up for a challenge though! Thanks for linking up with #wkendtravelinspiration! It was not fun, I can tell you but once across the cycle was lovely. Hmm. I don't cycle anymore and your description of cycling in Hobart we definitely keep me from trying. I've heard that Tasmania is expensive and the entry price for MONA seems to agree with that. I thought the entry price for the MONA was very steep, but plenty of people seemed to be happy to pay it. Your posts contain so much useful information for people who like cycling, Lyn. I wish I was this good on my bike, but I am not. If the Tasman Bridge was a challenge for you, I imagine it must be very difficult for someone like me. #TheWeeklyPostcard. I would not recommend anyone cycle across unless they are very confident on a bike. We used to buy our bikes in the USA when we went there because it is such a hassle flying them but we had a bad experience not being able to get decent bikes under US$200 each and now we have gone back to flying them. We would give the cheap bikes to a charity shop at the end of each trip. Tasmania is a great destination. The weather can be tricky though, so you need to go at the right time of year. Wow, I would love to bicycle around Hobart. First, I have to actually visit Tasmania but it is always on my mind. Haha - just do it! You'll love it. Every time I read your blog I want to do more cycling - now you've made me want to go back to Tasmania and cycle! You must be doing something right!! Seriously though, this looks like an awesome way to see more of Tassie. Much better than a road trip. David and I are coming to Perth twice this year and planning to cycle while we are there. Why don't we meet up and cycle the Swan River path. I think we have talked about this before! I always appreciate your honesty in the reviews of experiences Lyn. Even though we do a lot of road biking with traffic the Tasman Bridge sounds like only made for those of iron nerves. You and Dave would probably find it a breeze - lol! I'm not a cyclist, but you make me think I should take it up. Except for the The Tasman Bridge. That looks terrifying. Honestly, I wouldn't start your cycling career with the Tasman Bridge - lol! North America, both Canada and the U.S. have fantastic cycle trails. HI, Lyn. 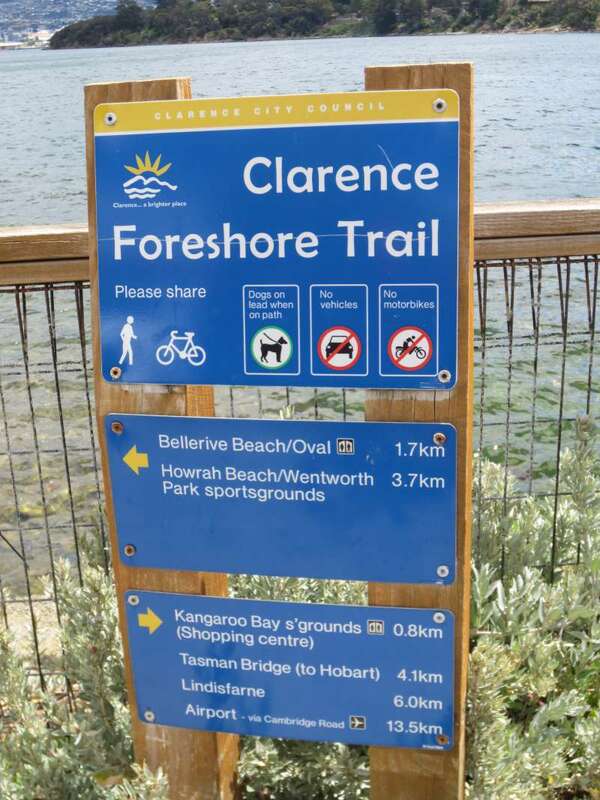 The Clarence Foreshore Trail looks like a great place to cycle. Thx for sharing.